Let's be honest here. Brock Lesnar has to win at WrestleMania 35! Whether The WWE Universe likes it or not, Brock Lesnar retaining The Universal title at WrestleMania 35 is best for business. Of course, fans are going to chime in about Lesnar being a part-time champion and how he doesn't even respect the belt he currently holds, but they can't deny the monumental benefits that having Lesnar as champion yields. Again, this doesn't mean it will be a popular decision among fans by any means, especially since it will likely mean more of the same, but the company absolutely needs Lesnar as the champion for the foreseeable future. Beyond that, they need the mainstream attention that having Lesnar as champion holds. 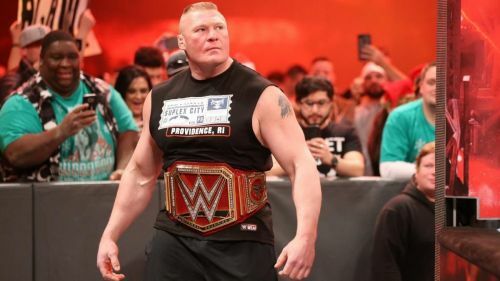 With that being said and WrestleMania 35 right around the corner, here are four reasons why Brock Lesnar will retain The Universal title at this year's show of shows. As always be sure to let us know your thoughts in the comments below and also be sure to tell us who you think should win The Universal title at WrestleMania 35. Can Seth Rollins slay The Beast at WrestleMania 35? Seth Rollins somehow overcoming Brock Lesnar's heelish onslaught and slaying the beast at WrestleMania 35 isn't at all believable and will do more to hurt Lesnar than to help Rollins. In fact, Rollins is in that rare position right now that he could probably come up short against the beast and still gain massive respect from The WWE Universe in the process. In the end, Rollins just isn't the right size to make a win over Lesnar even look remotely believable. Beyond that, it will take a level of cartoonish booking that won't feel organic to The WWE Universe and won't really get Rollins's title reign off to the start that it needs.